At AAA Fire Protection Services we offer comprehensive fire sprinkler installation at affordable prices. 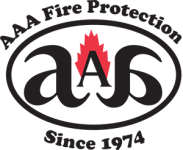 As a 40 plus year veteran of the fire protection industry, AAA Fire Protection Services offers complete fire sprinkler services, including fire sprinkler installation and routine and scheduled service for fire sprinklers inspections. In addition, we offer fire sprinkler repairs as a courtesy to our clients. We also gather data and provide documentation that helps show your business is compliant. At AAA Fire Protection Services we make it easy to decrease the risk of fire and to help reduce the damages from fires that do occur. Our expert design team is happy to work with your architect or your design team for the design and installation of a fire sprinkler system that's designed specifically for your building. We work with Saratoga businesses and businesses throughout the South Bay area as well as with businesses that are in unique industries. If you'd like more information about how we can help you, just give us a call at (800) 543-5556. Our professional service team will be happy to answer your questions or provide you with a job specific quote.